Brandenburg's reputation as refuge for religious refugees set the ground for the admittance of reformist immigrants in the second half of the 17th century. A huge part of them were French huguenots. The Thirty Year's War (1618-1648) had hit the country hard. Some areas, like the Uckermark, lost 90% of its population. In this situation the elector Friedrich Wilhelm made an effort to balance out the population loss through targeted immigration policy in order to rebuild the destroyed areas. In the beginning, people from neighbouring areas were coming. Little by little, however, the Brandenburg elector specifically recruited reformist settlers from the Netherlands and Switherland. When the first restrictive religion policys of Louis XIV suppressed and persecuted the reformist subjects, the so-called huguenots began to leave the country from 1679 onwards. Through the Edict of Potsdam (1685) the Brandenburg elector sought to draw them into his country and regulated their settlements. In total, around 20 000 refugiés - not only from France - were migrating to Brandenburg. Among them were merchants, craftsmen, artists, entrepreneurs, soldiers, but also farmers. They were settled in cities, in already existing towns among the local population, or in completely new towns, so-called colonies. Aside from the goal to "populate" Brandenburg again and to profit from huguenots's economic skills, religious policy motives played a role. The dynasty of the Hohenzollern was Reformist, but the majority of their subjects Lutheran. There were repeated conflict. Thus the prescribed tolerance from above, namely the acceptance of the Reformist religious refugees, was not met with enthusiasm by the Lutheran subjects. They interpreted it as a strategy to strengthen the influence of the Reformists in the country and to diminish the significance of the Lutheran cities. The immigrants were granted a range of privileges in order to enable them a new succesful start in Brandenburg. For example, they were exempt from membership of the guilds and thus taxes for 1,5 decades. They were granted their own jurisdiction and administration, their own parishes, and schools. Until the beginning of the 20th century, the French language was used among the Brandenburg huguenots, particularly in church. The immigrants brought extensive knowledge in manufacturing, craft and agriculture. Thus they not only contributed to the reconstruction of Brandenburg after the Thirty Year's War, but also shaped the country's culture significantly, not least in culinary terms: cauliflower, asparagus, green beens and salad are part of the popular vegetables as well as coffee and white bread for breakfastin Brandenburg's kitchen. 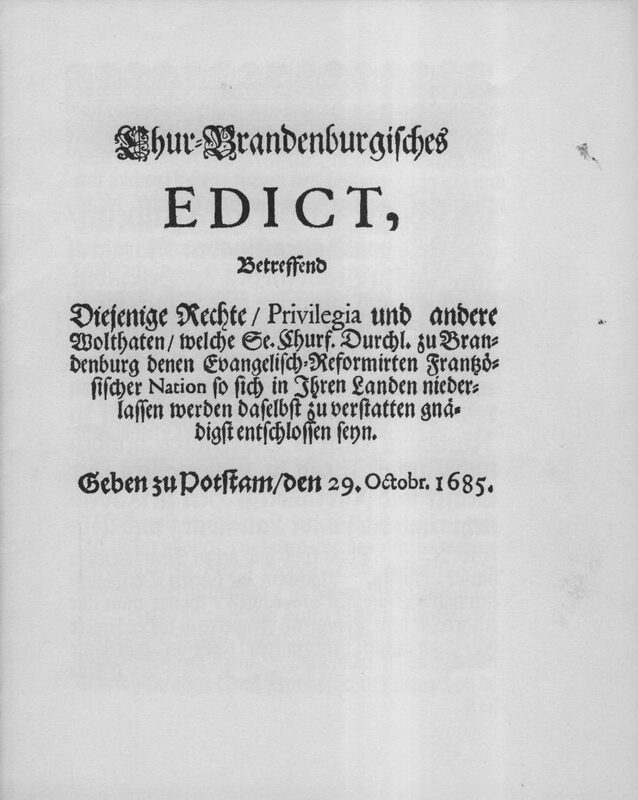 The most famous example of the many decrees of the elector that were aimed at the settlement of Reformists from other countries is the Edict of Potsdam in 1685. The Edict sought the immigration of French huguenots as religious refugees who were seeking shelter from French persecution. For the overview text of migration in Brandenburg click here!